Start Shopping for Wigs and Hairpieces! Feke Wigs sells women's human hair wigs and synthetic hair wigs, hairpieces, hair extensions, hair additions, toppers, pull-thru wiglets, ponytails, braids, bangs, claw and butterfly clips, clip-on pieces, hair care, accessories and more, at discount prices. We offer a full line of wigs and hair pieces for women experiencing hair loss or hair thinning due to cancer chemotherapy, alopecia areata, chronic hair pulling (trichotillomania), anagen or telogen effluvium, or female pattern baldness (androgenic alopecia). The special monofilament design makes it look like hair is actually growing from your scalp, giving you the most comfortable and natural look possible. 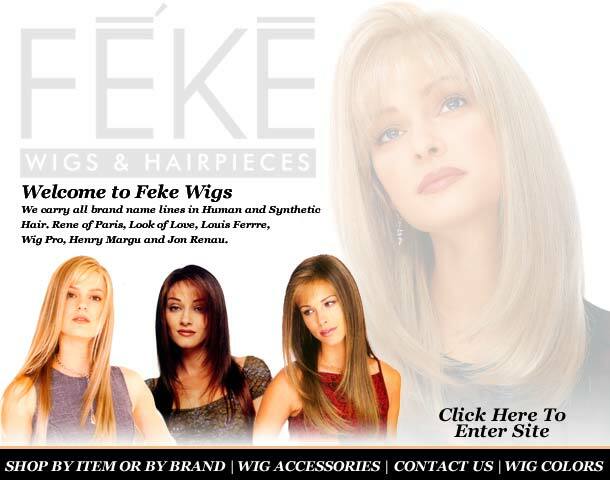 Feke Wigs also carries wigs and hairpieces in short, medium and long lengths, and in petite and large sizes. Learn how to wear, style and clean your wig or learn how to measure your head to find your wig size. Feke wigs and hairpieces come in a wide selection of gorgeous hair colors, including specialty colors that are highlighted, tipped, frosted, three toned, blended or airbrushed. View hair color samples. We urge you to send us a swatch of your own hair so that we may help you select the best color match possible. We also sell and loan hair color rings for your convenience. Feke Wigs provides professional wig alterations for those customers who would like to personalize a new wig's hair style. Professional cutting, trimming or size alterations are available for an additional charge of just $45.00. Please email one of our wig consultants, who will be happy to help you with this popular service. Feke Wigs offers a wholesale program to wig boutiques, hair salons, beauty suppliers and other retailers or individuals interested in carrying our products. We also offer discount pricing to Licensed Cosmetologists and Dance Studios. Customer service is the number one focus of Feke Wigs. We are especially proud of our reputation in assisting those customers with medical hair loss problems. It is of great personal and professional importance to us that each of you find your experience with us to be an uplifting one. Please read our customer testimonials for insight on how we treat our customers. We also value our clientele in the transgender, transvestite and cross-dressing communities who, along with the rest of our customers, know they can depend on us for absolute privacy and discretion. Fekewigs.com uses the same secure internet encryption used by major Internet companies. No personal identifying information is displayed online or made accessible to the public, via our web site or e-mail. We do not sell or rent our customer information to any source under any circumstances! Please read our Customer Service and FAQ pages for answers to many common questions regarding our products and store policies. We accept Visa, Mastercard, American Express and Discover credit cards for your convenience.